Police in the Bronx, NY are searching for a gunman who shot 21-year-old Allen McQueen in his face in broad daylight as he was holding his 1-year-old daughter in his arms outside his apartment building. Allen was rushed to a local hospital where he was pronounced dead. His daughter, Taylor, suffered a bump on her head and was treated and released from the hospital. The shooting took place at 1:30pm Tuesday across the street from playground, which was teeming with children. "I saw him take his last breath. I saw him spit up blood. 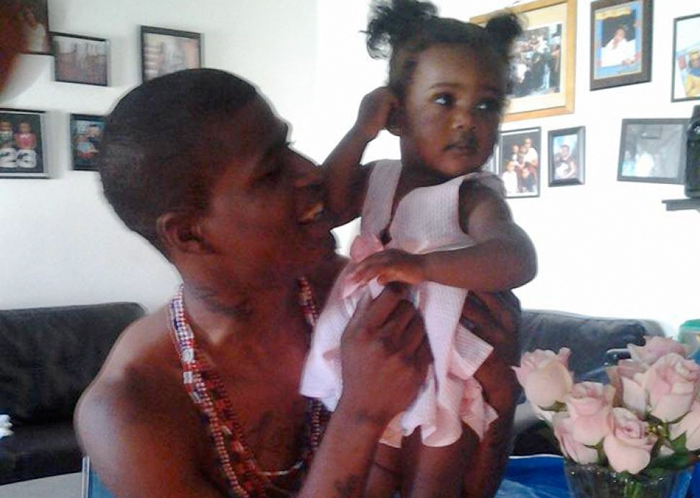 I grabbed the baby from underneath him, she was drenched in blood," eyewitness Arielle Corkery, said. "She was in shock she was just staring up into the sky." Police say Allen had been arrested 23 times for robbery and assault. He was also a member of the Taylor Crew, a violent street gang in the neighborhood and he was known to carry a gun. His father, Woodrow Hines said: “He had problems with other people, but he’s young. He was a good dad. He had just left our house, too. He said he was taking her to the park.” The gunman, described as a man in his 20s wearing a black shirt with white lettering, drove off in a Mercedes-Benz with a license plate beginning with the letter G. On March 12, cops arrested Allen after finding him in a stolen white Mercedes with a license plate that started with a G, but the two cases do not appear to be related, according to investigators.